These beautiful apartments are on the top floor of the house located only 20 meters from the beach. The closed staircase leads to the apartment Pegasus studio, at the entrance to the first floor, on the left. The apartment consists of a mini kitchen, partially separated from the sitting and dining area with a charming partition. In order to make your stay as pleasant as possible, sleeping area is also separated from the sitting area. The studio, of course, has its own bathroom. The Pegasus studio has a terrace that offers breathtaking views of the sea and the nearby island of Brač. Right next to the Pegasus studio is a multifunctional Pegasus apartment, which, if necessary, can be a two bed or four-bed apartment. The Pegasus two bed apartment has a beautiful spacious living room with kitchen and dining room, an also has a terrace with views of the sea and the island of Brač. The bedroom is completely separated and has its own bathroom and terrace with sea view. 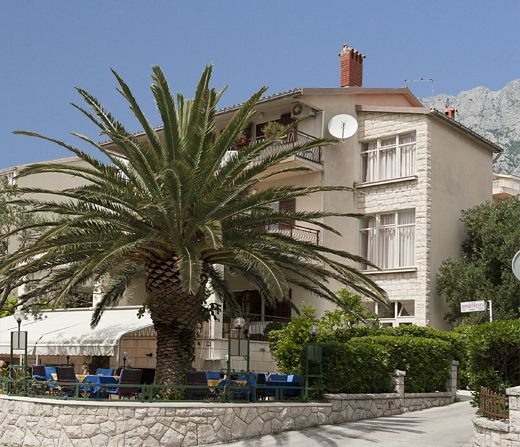 If for your vacation in Makarska you need a larger apartment, there is an extra room with bathroom, and the Pegasus becomes a four-bed apartment with its own entrance. The Pegasus extra room can be rented individually because, in addition to the bathroom, it also has a private terrace. Nearby the Pegasus apartments and this well-situated house, you can find a number of restaurants, beaches, bars and shops, wellness facilities, gym, tennis courts, diving school... The town center is only a ten-minute walk away along the beautiful promenade by the sea. Another advantage of the Pegasus apartments is air conditioning adapted for cooling and heating, so the apartments are suitable both for summer and winter vacation.